Hands on Science teacher, Ms. Denton, receives mini grant. Ms. Denton is excited about receiving a mini grant from National Mid-level Science Teacher Association. Ms. Covey Denton, our Hands on Science teacher, was awarded a mini-grant for her 6th grade classroom from NMLSTA (National Mid-level Science Teacher Association). She will receive $200 to be used towards the purchase of a vacuum pump. Ms. Denton received a Bell Jar from generous donations from Helping Hands through the Greenfield Volunteer Organization. 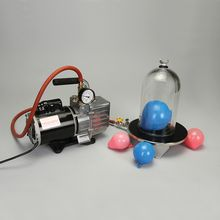 The bell jar, along with the vacuum pump will be used to explain the effects of reduced air pressure. This is useful when learning about Space science and also weather phenomenon. Our 8th grade physical science class will also be able to benefit from having this equipment in our lab.